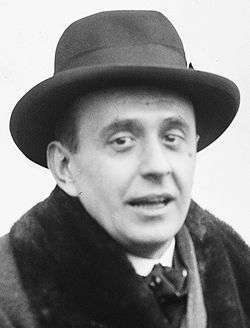 Jan Garrigue Masaryk (14 September 1886 – 10 March 1948) was a Czech diplomat and politician and Foreign Minister of Czechoslovakia from 1940 to 1948. American journalist John Gunther described Masaryk as "a brave, honest, turbulent, and impulsive man". Born in Prague, he was a son of professor and politician Tomáš Garrigue Masaryk (who became the first President of Czechoslovakia in 1918) and Charlotte Garrigue, Tomáš Garrigue Masaryk's American wife. Masaryk was educated in Prague and also in the USA, where he also for a time lived as a drifter and lived on the earnings of his manual labor. He returned home in 1913 and served in the Austro-Hungarian Army during the First World War. He then joined the diplomatic service and became chargé d'affaires to the USA in 1919, a post he held until 1922. In 1925 he was made ambassador to Britain. His father resigned as President in 1935 and died two years later. He was succeeded by Edvard Beneš. In September 1938 the Sudetenland was occupied by German forces and Masaryk resigned as ambassador in protest, although he remained in London. Other government members including Beneš also resigned. In March 1939 Germany occupied the remaining parts of the Czech provinces of Bohemia and Moravia, and a puppet Slovak state was established in Slovakia. When a Czechoslovak Government-in-Exile was established in Britain in 1940, Masaryk was appointed Foreign Minister. During the war he regularly made broadcasts  over the BBC to occupied Czechoslovakia. He had a flat at Westminster Gardens, Marsham Street in London but often stayed at the Czechoslovak Chancellery residence at Wingrave or with President Beneš at Aston Abbotts, both near Aylesbury in Buckinghamshire. In 1942 Masaryk received an LL.D. from Bates College. Masaryk remained Foreign Minister following the liberation of Czechoslovakia as part of the multi-party, communist-dominated National Front government. The Communists under Klement Gottwald saw their position strengthened after the 1946 elections but Masaryk stayed on as Foreign Minister. He was concerned with retaining the friendship of the Soviet Union, but was dismayed by the veto they put on Czechoslovak participation in the Marshall Plan. Czechoslovakia sold arms to Israel during the 1948 Arab–Israeli War. The deliveries from Czechoslovakia proved important for the establishment of Israel. The first contract was signed on January 14, 1948, by Jan Masaryk, the Czech foreign minister. In February 1948 the majority of the non-communist cabinet members resigned, hoping to force new elections, but instead a communist government under Gottwald was formed in what became known as the Czech coup (Victorious February in the Eastern Bloc). Masaryk remained Foreign Minister, and was the only prominent minister in the new government who was neither a Communist nor a fellow traveller. However, he was apparently uncertain about his decision and possibly regretted his decision not to oppose the communist coup by broadcasting to the Czech people on national radio, where he was a much loved celebrity. Memorial plaque with Masaryk´s quote "Pravda vítězí, ale dá to fušku" (The truth prevails, but it's a chore). It is a reference to Czechoslovak national motto Veritas vincit (Truth prevails). Jan Masaryk with Laurence Steinhardt, the United States Ambassador to Czechoslovakia. On March 10, 1948 Masaryk was found dead, dressed only in his pajamas, in the courtyard of the Foreign Ministry (the Černín Palace in Prague) below his bathroom window. The initial investigation by the Ministry of the Interior stated that he had committed suicide by jumping out of the window, although for a long time it has been believed by some that he was murdered by the nascent Communist government. (Others in the country put it thus: "Jan Masaryk was a very tidy man. He was such a tidy man that when he jumped he shut the window after himself.") In a second investigation taken in 1968 during the Prague Spring, Masaryk's death was ruled an accident, not excluding a murder and a third investigation in the early 1990s after the Velvet Revolution concluded that it had been a murder. Discussions about the mysterious circumstances of his death continued for some time. Those who believe that Masaryk was murdered called it the Third Defenestration of Prague, and point to the presence of nail marks on the window sill from which Masaryk fell, as well as smearings of feces and Masaryk's stated intention to leave Prague the next day for London. Members of Masaryk's family—including his former wife, Frances Crane Leatherbee, a former in-law named Sylvia E. Crane, and his sister Alice Masaryková — stated their belief that he had indeed killed himself, according to a letter written by Sylvia E. Crane to The New York Times, and considered the possibility of murder a "cold war cliché". A Prague police report in 2004 concluded after forensic research that Masaryk had indeed been thrown out of the window to his death. This report was seemingly corroborated in 2006 when a Russian journalist claimed that his mother knew the Russian intelligence officer who threw Masaryk out of the window of the west bathroom of Masaryk's flat. The highest-ranking Soviet Bloc intelligence defector, Lt. Gen. Ion Mihai Pacepa, described his conversation with Nicolae Ceauşescu, who told him about "ten international leaders the Kremlin killed or tried to kill". Jan Masaryk was one of them. From 1924 until their divorce in 1931, Masaryk was married to Frances Crane Leatherbee (1887-1954). An heiress to the Crane piping, valves and elevator fortune, and the former wife of Robert Leatherbee, she was a daughter of Charles R. Crane, a U.S. minister to China; and a sister of Richard Teller Crane II, a U.S. ambassador to Czechoslovakia. By that marriage, Masaryk had three stepchildren: Charles Leatherbee, Robert Leatherbee Jr., and Richard Crane Leatherbee. Stepson Charles Leatherbee (Harvard 1929) co-founded the University Players, a summer stock company in Falmouth, Massachusetts, in 1928 with Bretaigne Windust. He married Mary Lee Logan, younger sister of Joshua Logan, who became one of the co-directors of the University Players in 1931. Masaryk was a skilled amateur pianist. In that capacity, he accompanied Jarmila Novotná in a recital of Czech folk songs issued on 78 RPM records to commemorate the victims of the Nazi eradication of Lidice. At the time of his death, Masaryk was reportedly planning to marry the American writer Marcia Davenport. ↑ Gunther, John (1961). Inside Europe Today. New York: Harper & Brothers. p. 335. LCCN 61-9706. ↑ Carey, Nick (12 April 2000). "Czechs in History: Jan Masaryk". Radio Prague. Retrieved 28 October 2012. ↑ Masaryk, Jan (2011). Speaking to My Country. Lexington MA: Plunkett Lake Press. Foreword by Madeleine Albright. 1 2 3 Axelrod, Alan (2009) The Real History of the Cold War: A New Look at the Past, p. 133 New York: Sterling Publishing Co., Inc.
↑ Horáková, Pavla (11 March 2002). "Jan Masaryk died 54 years ago". Radio Prague. Retrieved 4 April 2009. ↑ "Books: Murder Will Out". Time. January 12, 1970. Retrieved May 5, 2010. ↑ "East Europe Could Shed Light on Trotsky and Some Americans; Masaryk a Suicide". The New York Times. January 28, 1990. Retrieved May 5, 2010. ↑ Cameron, Rob, "Police close case on 1948 death of Jan Masaryk - murder, not suicide", Radio Prague, 06-01-2004. ↑ Cameron, Rob, "Masaryk murder mystery back in headlines as Russian journalist speaks out", Radio Prague, 18-12-2006. ↑ Leatherbee, Richard, "My Family Tree, 1772 - present", genealogyboard.com, December 13, 2005. ↑ See, Houghton, Norris. But Not Forgotten: The Adventure of the University Players. New York, William Sloane Associates: 1951. ↑ Crutchfield, Will, "CLASSICAL MUSIC; Once, the Voice Was Melody Itself. In Fact, It Still Is", The New York Times, March 7, 1993, accessed October 30, 2008. Claire Sterling (1969). The Masaryk Case. New York: Harper & Row. Marcia Davenport (1967). Too Strong for Fantasy. New York: Charles Scribner's Sons. Wikimedia Commons has media related to Jan Masaryk.